Do you feel like back pain is ruining your career? We have created a variety of quality products which have helped tens of thousands of readers to enjoy lasting relief from their back pain. If you appreciate the research, experience, dedication, effort, sincerity and love that goes into our websites, then you will certainly enjoy and benefit from our products! We have helped people cure their pain effectively for 15 years without drugs or surgery. Our results speak for themselves. We keep the prices of these products as low as we can, in order to help as many people as possible. 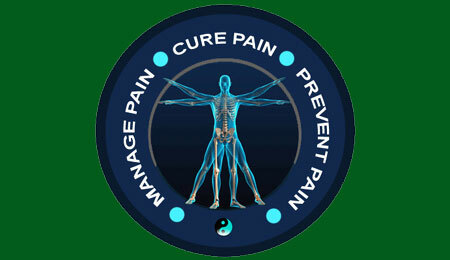 All of the money raised through the sale of these products goes to support the education, advocacy and community work of our many free websites, including Spondylolisthesis-Pain.Com. The cost of running these web resources is expensive and grows higher by the day, so we greatly appreciate your support in helping us to help others. For every product you buy, you are not only helping yourself, but also contributing to help others who might not be able to afford any professional care at all. Good karma will come back to you. The following 3 books should actually be read by everyone, regardless of whether they have back pain or not. These books are excellent for preventing pain and optimizing holistic health. BUY 3 BOOKS and SAVE! BUY 4 BOOKS and SAVE! The following 3 books are inspired by The Chronic Pain Coach’s proprietary, peer-acclaimed and award-winning pain coaching program. 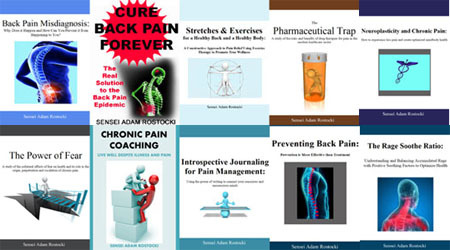 These books are ideal for pain that resists treatment, such as structurally-motivated conditions that never resolve. They teach necessary pain management and coping skills that are effective, safe and ideal for all diagnoses. The complete synergistic program provides an all-in-one solution that works, regardless of the diagnosis or the goals of the patient. This universally applicable program can cure pain now, prevent it from recurring and manage pain that might occur in the future. 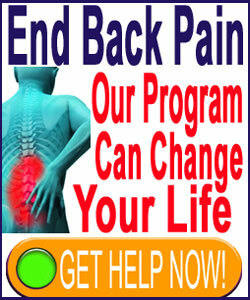 This is the total back care program that serves the needs of every person who has pain or is at risk of developing it. The Complete Bundle of 10 ebooks includes all the titles on this page. If you really want to be well prepared to end chronic pain through complete mindbody health, then this bargain package is unrivaled in its efficacy and value! How Much Money Have You Already Spent on Your Back Pain? You can end it all now. No more expense. No more back pain. What is a Pain-Free Life Worth to You? Anything & Everything You Want To Do! I first bought Cure Back Pain Forever in 2006 and used it to supplement my recovery efforts. I was successful and have since shared it with many friends and family. I have sent in my story to this website and had it published and I am so thankful for all the great work you do for people in pain. I must also say that I have used the lessons in this book to better advocate for myself in all health matters and would say it is probably the best money I ever spent. Thank you, thank you, thank you! I read this website for several months and enjoyed many of the articles. I found myself quoting it when discussing things with my doctor and found them to be interested in my new-found knowledge, which they described as “unusually deep and enlightened”. After all this, I thought I would read more from Sensei Adam and decided to buy the complete book bundle, although I was not sure if it would live up to claims made as far as helping my pain. Well, the books over-delivered, much like the material on the website. They provided me with a great understanding of the interactions of mind and body and have helped me to feel better, despite many health issues. My only regret was waiting so long to buy them, since I could have used the help earlier to get through some really rough times, but better late than never. The Cure Back Pain Forever Program is great. The books are succinct and easy to read again and again, which is exactly what you will want to do. I refer to the books often and can honestly say that they has done more to help me than any medical treatment I tried over a span of more than 20 years. Thanks Sensei Adam and I share your books with everyone in my life. I had read Dr Sarno’s books previously, but did not connect to them. I gave up the knowledge approach and tried the medical system once again to no avail. I found cure-back-pain.org and decided to give it another try. I really connected to Sensei Adam’s writings and found his way of explaining things to be empathetic and brilliant in its simplicity. I am fully recovered from crippling pain after many, many years of suffering with what I thought were herniated discs. I truly can not express my thanks enough. I am thrilled to endorse this product since it was the ONLY thing that helped me to overcome my own back pain. I was shocked and delighted to finally understand why my back pain had resisted successful treatment for so long. I was a little embarrassed that I did not realize the true nature of my pain on my own. Thank you again, Sensei Rostocki. This is one of the best alternative programs for curing back pain that I have ever seen in my 27 years practicing as an orthopedic surgeon. I have to admit that some of Sensei Rostocki’s commentary on the methods used to heal back pain was a sensitive subject for me to read about, but I can not deny the truth in many of his ideas. I have since integrated many of the concepts of this program into my own practice. This program made me completely change the way I diagnose and subsequently treat back pain. The ideas in these books made me realize that my traditional training in chiropractic was simply not enough to properly treat many chronic back problems. I thank the author for this wonderful program and recommend it to all medical professionals working to treat back pain. You owe it to yourself and you owe it to your family. This program has helped tens of thousands of back pain sufferers to be free of pain. Why waste any more time suffering with back pain? The sooner you start the program, the sooner you can see results. Act today and reverse the process causing your pain. Take Your Life Back. Be Free From Pain. We accept many payment types processed securely through PayPal.